We’ve all seen concentrated solar power (CSP) plants — those rows and rows of shiny mirror heliostats all crowded around a 100-metre-high pillar, like worshippers peering up at a towering god. The orchestra of mirrors track the sun throughout the day, bouncing rays up at the central tower where the heat is concentrated, converted into electricity and piped into the national grid. Only a small handful of these plants — like PS10, in the Spanish desert region of Andalucia — exist around the world. Their growth is restricted thanks to their sizeable footprints. “Concentrated solar thermal energy needs huge areas,” says Alexander Mitsos, the Rockwell International assistant professor of mechanical engineering, at the Massachusetts Institute of Technology. “If we’re talking about going to 100 percent or even 10 percent renewables, we will need huge areas, so we better use them efficiently,” he explains. Mitsos and colleagues have come up with a new design for CSPs that reduces the required amount of land while boosting the amount of sunlight the heliostat mirrors collect. In perhaps the most beautiful example of biomimicry yet, it’s inspired by sunflowers. The researchers at MIT, in collaboration with RWTH Aachen University in Germany, looked at the layout of current CSP plants. They put spaces between the mirrors and staggered them like seats in a movie theatre. This pattern results in shadows being cast on some mirrors, reducing the reflection of light. Mitsos’ lab developed a computational model to evaluate the efficiency of heliostat layouts — the system divides each mirror into discrete sections and accurately calculates the amount of light each section reflects at any given moment. Next they looked to nature to improve the design further. 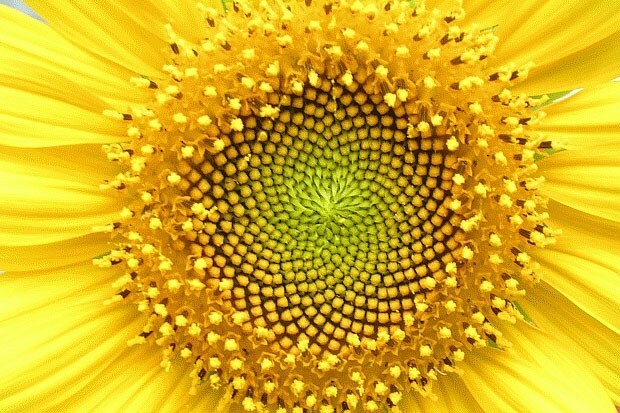 The florets of a sunflower — small flowers at the centre of the petals, which mature into seeds — are arranged in a stunning spiral fashion that’s impressed mathematicians for years. The arrangement — a form of Fermat spiral — has each floret turned at a “golden angle” – about 137 degrees – with respect to its neighbour. The researchers have published their results in the journal Solar Energy, and have recently filed for patent protection on the design. This entry was posted in Saving the planet. Bookmark the permalink.